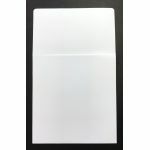 Minimum quantity for "120gsm Quality White Arco Paper Envelope LINERS" is 1. A superior off white 130gsm paper. Creased at the flap, flap 10mm short of top to allow double sided tape to be applied to the envelope.